WIDEO is a web-based animated video creation and presentation platform for SMBs, digital agencies, marketing professionals which enables users with no previous experience to create videos from scratch, or using one of WIDEO’s many templates. Brands can include their own images and audio to create a variety of animated videos for marketing, internal communication, product presentation, eCommerce, promotion, tutorials, Instagram stories, and more. WIDEO enables users to create their own custom animated marketing videos from scratch, or choose from a catalog of ready-to-use video templates designed to serve all types of marketing and business professionals. Brands can customize every detail of the template, and use the drag-and-drop feature to include handpicked images and soundtracks from WIDEO’s extensive media libraries, or their own unique content. Once finished, videos can be downloaded as an MP4 file, shared with team members and clients, or uploaded to social media networks such as Facebook or Youtube directly from the WIDEO dashboard. WIDEO’s templates help serve a wide variety of purposes such as marketing, business introductions, promotional videos, eCommerce, product presentation, tutorials, and more. Organizations can create videos for internal communication purposes such as weekly news, company guidelines, marketing success stories, special occasions and invitations, and more. Marketing video templates include Instagram video stories, Facebook Ads, and even electronics, real estate or mobile app explainer videos. Simple, template-based online app for creating video business presentations and more. For freelancers, small, medium and even some large businesses, Wideo.co is a reasonable return on investment. It creates simple or more sophisticated animated videos that will catch the attention of the business audience. It seems particularly fitting for Internet marketers and alike. A large support section and plenty of the video tutorials are available. It uses a not-secure, soon obsolete flash player for editing a video. There are many other similar online and offline applications. The limitations exist within the less expensive subscription tiers. Study the comparison columns before a purchase. Spend some time with the app, visit their YouTube channel and decide if your business benefited from this particular platform. It is a good solution for what it is within its limitations.Moderately easy template-based creation of a business presentation video and more. Able to control individual frames for detailed animation. The auto-save feature automatically saves the work every three minutes. Clear and responsive interface. Special discount for educators and students. Rather expensive plans, but with a discount on annual billing. Occasional promotions and specials. The 7-day trial does not require a credit card. Control the privacy of the videos. Imports MP3 files. Videos can be reusable over and over. Cloud/web-based so it can be used on a variety of platforms. Chrome extension available. Compatible with Google Drive. Variety of tutorial videos and how to articles. Available in English, Spanish, Portuguese and Korean languages. The social media uploads, including the YouTube. High-definition video formats downloads. Moderately easy template-based creation of a business presentation video and more. Able to control individual frames for detailed animation. The auto-save feature automatically saves the work every three minutes. Clear and responsive interface. Special discount for educators and students. Rather expensive plans, but with a discount on annual billing. Occasional promotions and specials. The 7-day trial does not require a credit card. Control the privacy of the videos. Imports MP3 files. Videos can be reusable over and over. Cloud/web-based so it can be used on a variety of platforms. Chrome extension available. Compatible with Google Drive. Variety of tutorial videos and how to articles. Available in English, Spanish, Portuguese and Korean languages. The social media uploads, including the YouTube. High-definition video formats downloads. Flash must be enabled to run the web application. Less expensive subscription tiers present substantial limitation. The one-minute limitation does not justify the basic package price. The seven-day only trial. A video download not-allowed during the seven-day trial. A user video upload/import not-possible at all. During the editing process, impossible to apply different sounds to various scenes. No audio effects per animation nor a video. Sounds fade out if shorter than a video. No free subscription plan available. Only Roman and Korean alphabets supported but, it uploads the text-based images. The interactive video option only applies to its native player. Zoran, thank you very much for your review! We are glad you've found Wideo easy to use. We are working on a new html5 based version to stop having to manually activate Flash plug in. We hope to have it ready as soon as possible. The simplicity of use, like building a PowerPoint or KeyNote presentation. Also the clean look. That's my answer! Last time I used it, I found it hard to create certain special effects. For eg. I tried to create a dropping feather in one video. That's probably a job for Adobe AfterEffects. Allison, thank you so much for your feedback. Detailed animations like a dropping feather effect are indeed possible in Wideo, but require an advanced and more complex use of keyframes. I¿ve specially created a video project (which I¿m sharing here so you can reuse to inspect https://wideo.co/es/view/21502973382464-dropping-feather-effect) and I¿m also sending via email a GIF to show you the process it took to create the effect. From the user front end what is not possible right now is to control the animation easing curves. This is set by default with a deceleration by the end of each keyframe to help non-advanced users create soften fluid animations. Of course this particular animation, with more work, can look even better. But I just wanted to picture the example quickly. I find that it will be useful and worth the investment for a business that needs lots of videos and which doesn't need them to be very original.I like that it is very easy to use, you don't need previous knowledge about video making, as you have many templates to choose from. You can also create your ouwn video from scratch, but I have never done it this way because my creative skills are non existent. I like that it is very easy to use, you don't need previous knowledge about video making, as you have many templates to choose from. You can also create your ouwn video from scratch, but I have never done it this way because my creative skills are non existent. What I don't like about Wideo is that you cannot download your creations during the trial period, you can only use this time to learn how to use it and evaluate whether it is worth the money for you. Also, the templates that you can choose from are more than enough, but at the end, they are limited, so possibilities are that you will find the same template used in another video in another website, which is not cool. After all, we all want to have exclusive videos. Of course, you can create your own exclusive videos in Wideo, but you will need to be creative and imaginative, which I'm not. Thanks for the review. The idea of the free trial period it's exactly that, that users can try our video editor. For downloading the videos you have to change to the premium (and paid) subscription. Regarding the templates, I can assure you that we have never encountered that issue of a video being duplicated. We have so many different templates and we are always creating new ones that it's almost impossible! - It is very easy to make changes and see them reflected quickly. - Easy to use without previous knowledge of animation. Hi Luciano, thank you for the feedback! We are very glad to make your job easier. We¿ve analyzed including filmed video importing feature in the past. However, we¿ve decided to focus exclusively on animated videos since that¿s were we are experts on. Besides we couldn¿t find a good way to perform that kind of files in our tool yet. Notice you can still import animated GIF files (animated icons, filmed gifs videos, screencast demo videos, etc) and work above them with graphics, fonts, and animations. What I love most about Wideo is the speed. I can crank out a video for our clients in like 20 minutes. That gives me so many options. Holiday party coming up? Let me just slip on Wideo and make a video card. Need a lengthier explainer for your clients? Wideo's got templates that will make the final product look clean and professional.I love how easy it is to use. I don't have a video editing background; but ever since I started using Wideo, I'm creating stellar videos at work. I love how easy it is to use. I don't have a video editing background; but ever since I started using Wideo, I'm creating stellar videos at work. I wish there were more animation options and presets. Hopefully that's clear. Sometimes, to get the effect I'm looking for I'll have to edit video template slides...I'd love for Wideo to have more robust tutorials and better functionality. Thanks Mitch for your review! We are glad that you find Wideo easy to use. As you wrote, Wideo can be used by anyone no matter if they have video editing background. We are constantly working on new animations options and presets as in more tutorials. You can check them in our website. Again, thanks for your response! Marketing professionals can quickly create custom, animated, HD quality videos without any previous experience using WIDEO's simple and intuitive interface with drag and drop functionality. Wideo provides over 75 ready to use templates for a multitude of purposes such as explainer videos, weekly news, Instagram stories, company guidelines, real estate, and more. Wideo helps brands to step up their content creation game as well as increase their social media engagement and boost CTRs (click-through rates). Users can maintain full creative control and can customize every detail as they design professional animated marketing videos with Wideo. Download copies of the custom created videos as an MP4 or share them to social media networks such as Facebook or Youtube with one click. Below are some frequently asked questions for WIDEO. Q. What type of pricing plans does WIDEO offer? Q. 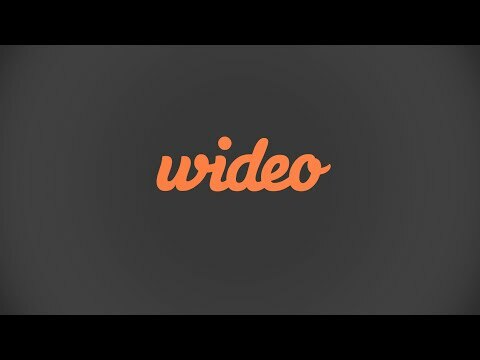 Who are the typical users of WIDEO? Q. What languages does WIDEO support? Q. Does WIDEO support mobile devices? Q. Does WIDEO offer an API? No, WIDEO does not have an API available. Q. What other apps does WIDEO integrate with? Q. What level of support does WIDEO offer?